If you are a woman, you can imagine yourself wearing the coat (over a slinky dress – over a slinky body) walking into a cocktail party, drinking a dry martini, hobnobbing with film producers, sharing witty asides with Barack Obama over appetizers, and chatting with Hillary Clinton in the Ladies Room. If you are a man, you can imagine that the woman in the coat is wearing nothing but the fur. Perhaps you are with her in front of a fireplace. You are sharing a glass of wine and looking into the flames as though they were about to reveal the future. 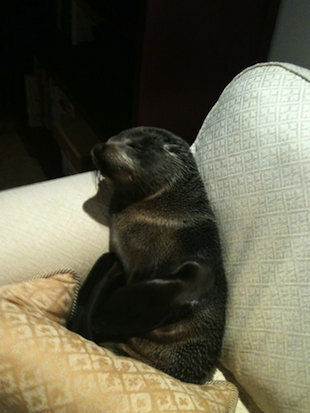 Does this seal look like a coat to you? I have never personally clubbed a seal to death. I have never made any money from a seal’s demise. I have never bought a sealskin coat. My fur was given by my grandfather to my grandmother. I remember her wearing it. She did not wear it often. No doubt she “saved it for best,” and opportunities for best did not occur often enough. During this holiday party season, I’ve seen any number of furs. Chatting with the fur-clad women, I’ve asked them if they have any ambivalence about wearing fur. All of them inherited their furs, and all of them have said that their furs were too old to be offensive: given the age of their furs, they were immune to environmental criticism. I get that. In Russia, a common deathbed/gravesite saying is “May the Earth be a fur to her.” How lovely is that! I think I’d like to be buried in my fur. Checking the Internet, Colorado seems to be moving ahead in terms of green burials. Karen van Vuuren, is the executive director of the Boulder non-profit Natural Transitions. Front Range communities are leading the way in the green burial movement. Fort Collins has already set aside 27 acres of six-foot-wide plots for green burials. Roselawn (what a traditional name for an untraditional site!) will be seeded once with native grasses and then neglected. Bodies leaking embalming fluids will not be allowed. No plantings or vases will be allowed. Markers will be flat pavers. Those buried will be wrapped in shrouds and/or placed in decomposing caskets. As for me, I’d like to be buried on our Centennial Ranch property. From Promontory Ridge, you can see forever. Custer County is considering green burials, and come the new year, as the county commissioners work on revising the county resolutions, they will be taking advice from our coroner Art Nordyke and other interested parties. Meanwhile, I’m moving ahead with my plans. This spring we should dig a grave in case I should die during frozen-ground weather. As to the shroud, winter or summer, I’d like be buried my fur. The coat will warm me, and the seals will finally be at-rest. In keeping with the Egyptian custom, I would like friends and relatives to bring gifts to see me on my journey: chocolate, coffee, brandy, books, notebooks, and pens would be a start. A camera would be good. As a computer would be useless and I’d be lost without Google search, an abridged encyclopedia would be handy. And I’ll need some money to see me across the River Styx. I doubt that I’ll need a map. List all the things that you are taking with you to the next world. This entry was posted in Uncategorized and tagged CO, Custer County, fur coat, green burials, Karen van Vuuren, Natural Transitions. Bookmark the permalink. Awww, can’t we have the chocolate and brandy while you are still alive? Yes, a woman cannot have too much chocolate. Speaking for myself, I find chocolate wonderful in terms of mood enhancement. It is the most effective, over-the-counter drug I know. As for the brandy, you’re note reminds me to look for my prune vodka recipe. Another cure-all. I have had the pleasure and privilege in making shrouds (www.kinkaraco.com) for the departed out of everything imaginable that is of organic origin for the past 7 years now and they are buried on land and sea and cremated from Atlantic to Pacific coasts. It is a holy thing to wrap a loved one in a shroud and lay them to rest in the Earth. GREEN cemeteries are holy places as well .More and more green cemeteries are being created every year and the traditions of coming with families and friends to visit these peaceful lands is replacing the plastic box of ashes stuck in the back of the closet. With the fierce intention to make our own way during our “reign” as a generation, we so often throw the baby out with the bath water”. We lost the traditions of Death and Dying in an attempt I believe to be more “sustainable” but a cynical ceremony-less cremation culture was born in the 60’s devoid of ritual . Now regaining new traditions in HOME FUNERAL and GREEN BURIAL the profound mystery of Death is being taken back primarily by women as was Natural Childbirth in the late 1960’s & 70’s. Birth and Death have alot to teach those who want to “know”. Bless you and the seals! Dear Esmerelda, I find your “Shroudwoman” name and business quite compelling. I’d like to have a party where I would invite you and all your customers – my kind of people to be sure.